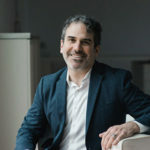 Michael drives organizations toward innovative, evidence-based diversity, equity, and inclusion solutions by drawing on a deep understanding of the social science behind culture and cognition, identity, and communication. Drawing on more than twenty years of experience from his own cultural anthropology research, he knows what works and uses those insights to create real change for organizations. Digital Solutions Lead, he ensures that best practices are incorporated into scalable digital products that engage and delight people with cutting edge social science, real people, and actual scenarios. He customizes sustainable change management plans for organizations that integrate the best of both in-person and scalable digital platforms.